Only a few of Brown’s B.C. paintings have been located. 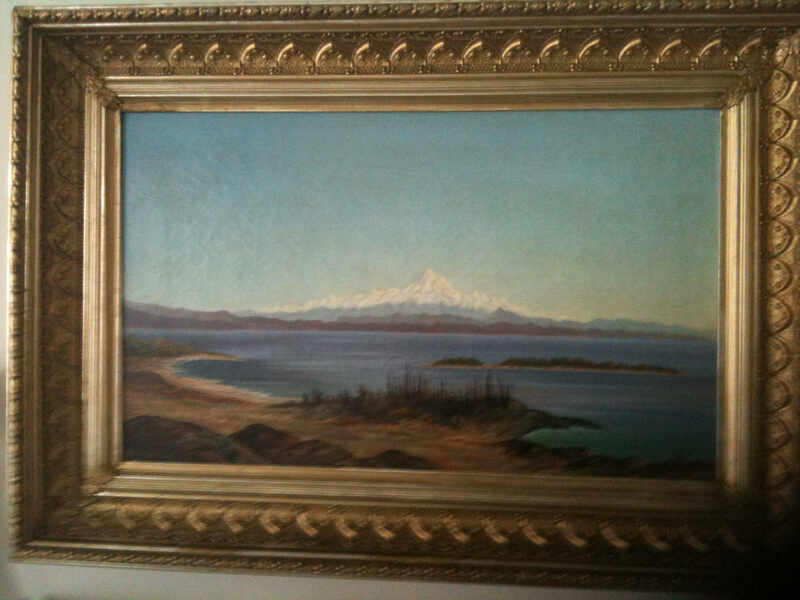 This is a list of all his known BC paintings including the few that are known to be in private or public hands and the many whose location is unknown. 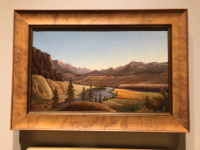 From the catalogue of his 1883 exhibit in Victoria I have been able to identify 22 paintings. We are very lucky that Brown had photos taken of many of his paintings in 1883 to show to potential purchasers his range and pieces that might be commissioned. Where I can, I have linked the photos that have survived at the BC Archives to the paintings described in the catalogue, but given the general nature of some of the catalogue descriptions, and the fact that someone, other than Brown has put speculative titles on several photos of his paintings in the BC Archives, these linkages may not be accurate. Because some paintings have come to light that are neither photographed nor in the catalogue we can assume there are more out there. Moreover, Brown often did multiple versions of a given subject so there may be more than one of each subject out there. Long Lake [Now called Kalamalka Lake] B.C., 1883 BC Archives Exhibit Catalogue 1 Catalogue: looking down the lake from the wagon road between Spallumcheen and Okanagan Valleys. Sketched October 9, 1882. BCA PDP00119 also photo HP23760 I80065. After the Storm, Shuswap Lake, B.C., September 24, 1882. Unknown Exhibit Catalogue 3 Catalogue: This scene represents the refereshing appearance of nature on the upper lakes after the frequent storms that occur at the beginning of the winter season. May be the same as L19. 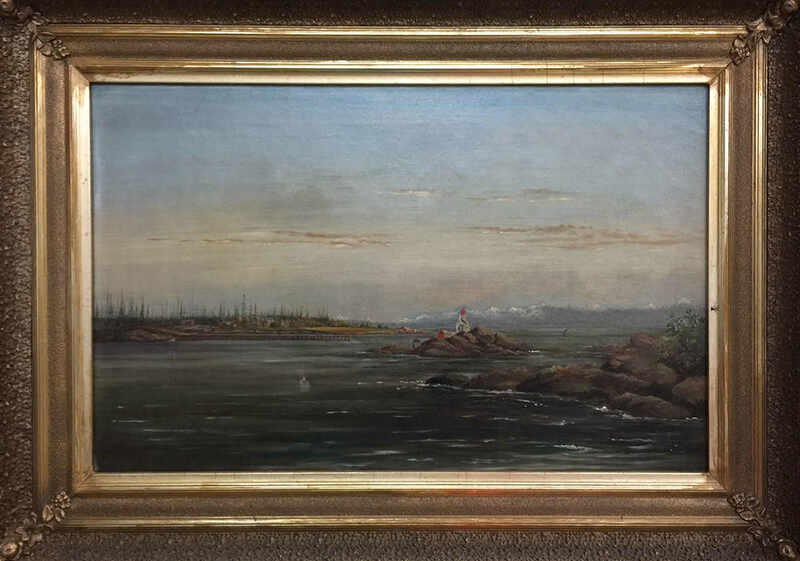 Clover Point, Victoria, B.C., March 8 1883 Unknown Unknown 5 Catalogue: view from Beacon Hill beach, BCA Note: A paintng of Clover Point, Victoria. Looking Down the Fraser River , from Hope, B.C., October 24, 1882. National Museum of African American History and Culture, Washington, DC Exhibit Catalogue 6 Catalogue: from Hope, BC. 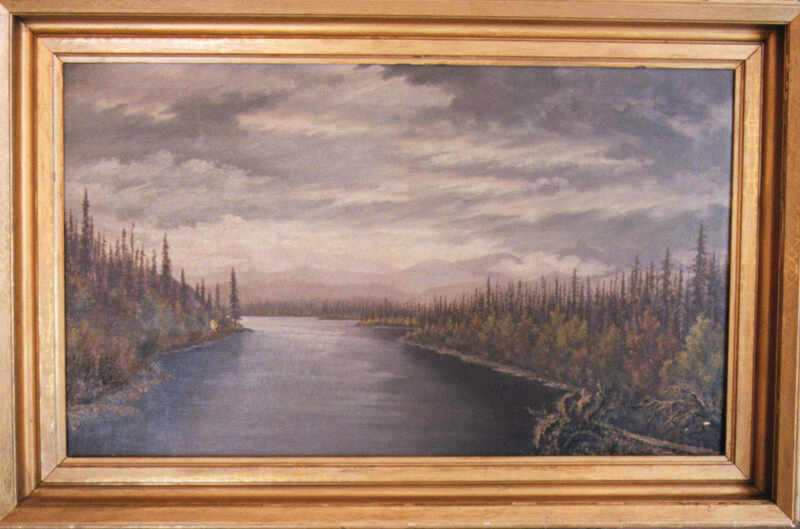 This may be the image L4 that the BC Archives describes as "Fraser River above New West". The Gorge, Portage Inlet, Victoria, B.C., , view from the east bank. April 24, 1883 Unknown Exhibit Catalogue 7 Catalogue: view from the East bank. BCA Note: The Gorge, and the second bridge; Victoria. Victoria Harbor, B.C. April 3, 1883. Unknown Exhibit Catalogue 8 Catalogue: from the foot of Fort St., Steamer Dakota entering. Sunset on Shuswap Lake, B.C. 1882 Unknown Exhibit Catalogue 9 Sketched September 29, 1882. 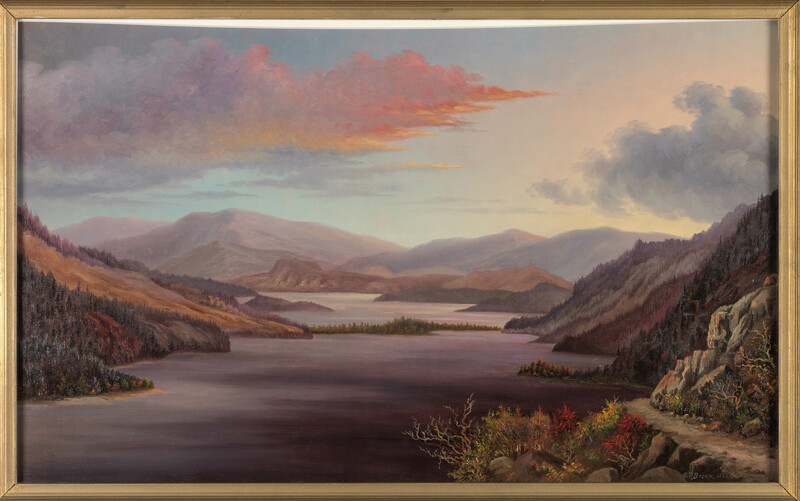 BCA note: A lake in the Spillimacheen but I think this is in error Coincides with Colonist June 26, 1883 p. 3 " The gem of the collection, is undoubtedly that entitled "Sunset on Shuswap Lake," which is simply perfection from an artistic point of view alone independently of its resemblance to the original. The effects of distance have been carefully preserved, while the heavy clouds hanging overhead, whose lights and shadows have been successfully delineated, and the calm, clear water to reflect in gold and crimson ihe declining rays of the setting sun; and the foliage of the trees, which thickly fringe the shores, borrowing its brilliant shades from the same source, lends an additional beauty to this lovely scene. " 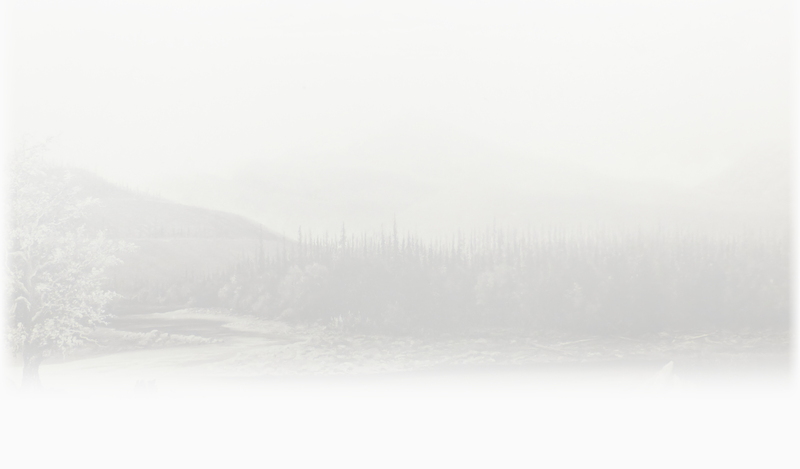 Early Morning at Vermillion Forks, B.C., n.d. Unknown Exhibit Catalogue 10 or North and South Similkameen Rivers, looking S.W from Allison's, the Cascade range in the distance. 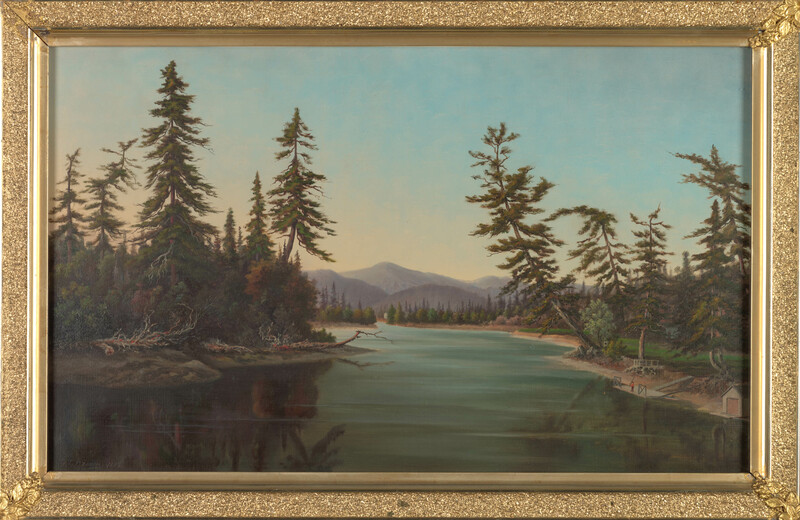 Painting described in newspaper Colonist July 5, 1883 p 3 "the grandeur of the mountain scenery is portrayed with wonderful taste, the Cascade range unfolding the majesty of mountain scenery. " Sketched October 19, 1882. Not signed or dated. BCA Note farm on the Spillimacheen. 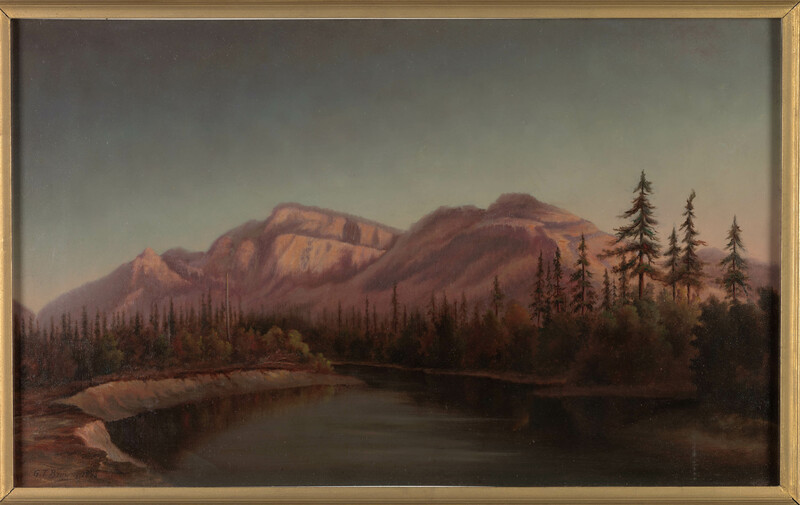 Twilight on the South Thompson September 15, 1882 Unknown Exhibit Catalogue 11 Catalogue: looking up river. Purchashed by Lt. Governor Cornwall July 1883. Natures' Vase and Bo[u]quet October 12, 1882 Unknown Exhibit Catalogue 12 Catalogue: This scene is laid on the banks of the Okanagan Lake, B.C., and is noted for its rare and curious freak of nature [a cube of granite 15 feet high formed the "vase" for a "bouquet" of three cottonwood and maple trees in autumn foliage]. Painting described in newspaper Colonist June 26 1883 p 3. Representing a mass of granite that has fallen from the mountain above, but on whose surface sufficient soil has formed to rear large trees of several kinds. - on the shores of Okanangan Lake. Above the Gorge, Portage Inlet, Victoria, B.C. April 25, 1883. BC Archives Exhibit Catalogue 19 Catalogue: from the bridge. BCA PDP00124. BCA notation says the Daniel Fowler Adams home visible in the distance at centre. Also See I-80078. 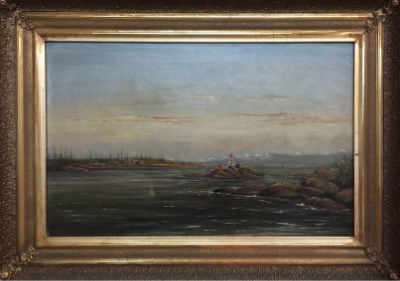 Race Rocks and Royal Roads from Esquimalt, B.C., May 1st, 1883. Unknown Exhibit Catalogue 20 Catalogue: From Esquimalt. Painting described in newspaper. Colonist June 26 1883 p 3. BCA Note "near Victoria Harbour". 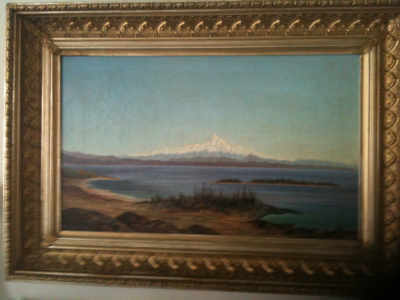 Mount Baker at Sunset March 1, 1883, Unknown Exhibit Catalogue 21 Catalogue: view from Beacon Hill, Victoria, B.C. Image PDP10284 courtesy of the Royal BC Museum, BC Archives. 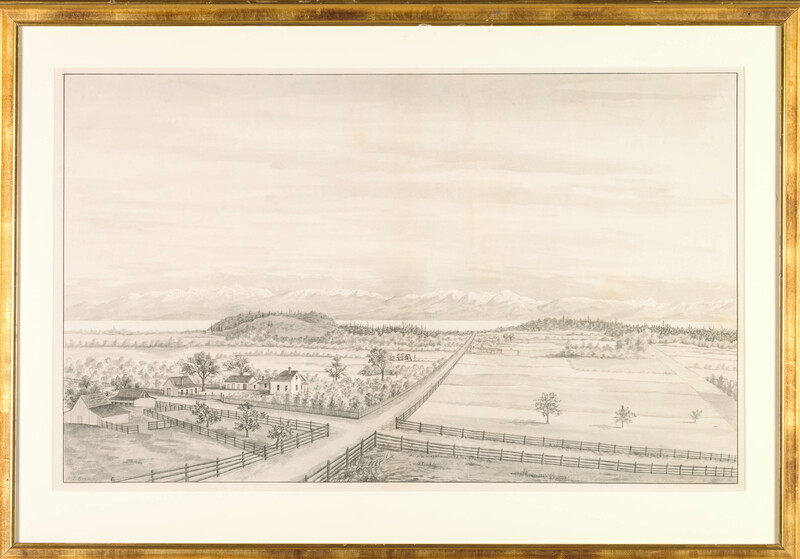 View from Eli Lequime Store, R[oman] C[atholic] Mission, Okanagan Lake October 10, 1882 9 ½ inches tall by 14 inches wide. Mark Hummel Fine Arts L1 Catalogue: sketch mentioned in newspaper. Colonist Nov 28 1882 p. 3 One of these unsigned works was a fall landscape with purple hills, overcast skies, and colorful foliage, painted on thin cardstock and measuring 9 ½ inches tall by 14 inches wide. 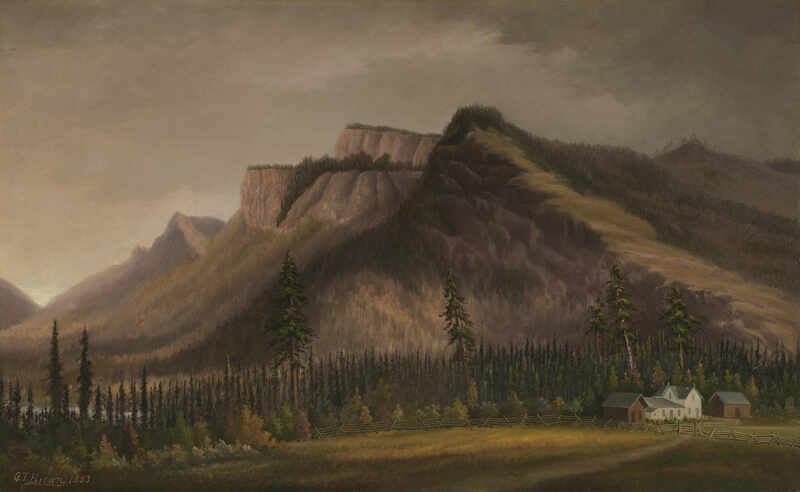 Written on back in pencil was the following: “View from the Eli Lequime store, R.C. 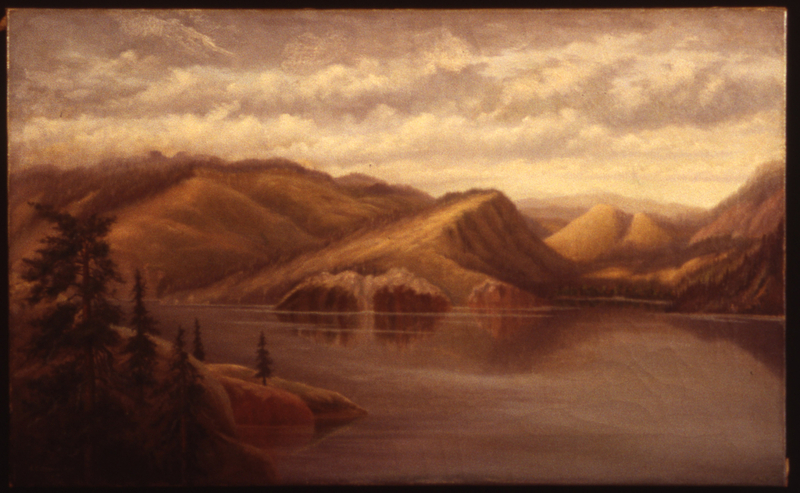 Mission, Okanagan Lake, B.C, October 10, 1882.”, from the second-story lodging roomsat the southern end of Long Lake. Montreal Ice Palace 1883 Unknown Colonist Feb 25 1883 p 3 L2 Painting described in newspaper. 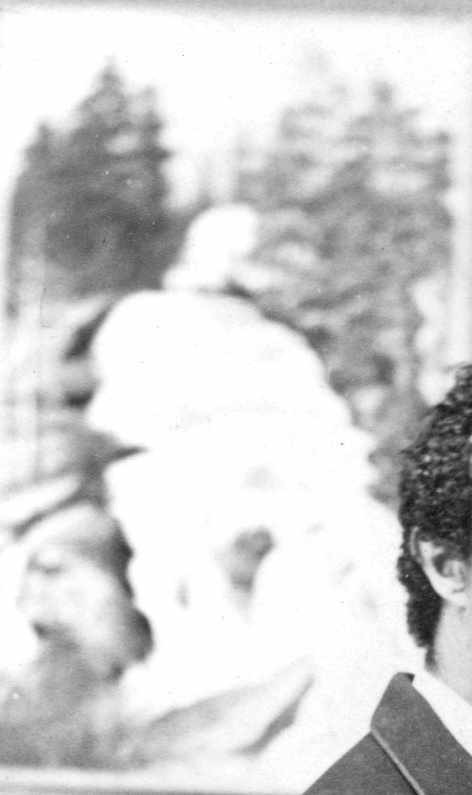 The Ice Palace – Mr G.T. Brown, the artist, to whose paintings of British Columbia scenery we have had had occasion to allude in complimentary terms, has just completed a handsome picture of the Montreal ice palace. The picture which is very effective and spirited, will be place in the show windows of Messrs W.&J. Wilson tomorrow. Fraser River above New Westminster, B.C. Unknown BCA H03542 L4 Not signed or dated. Title from BCA Note: Fraser River Abv New Westminster. View of Lake Okanagan 1882 National Museum of African American History and Culture, Washington, DC National Museum of African American History and Culture L6 Sold in 2006 by Derrick Beard, Atlanta. Detail of Tree 1883 Unknown Brown photo, BC Archives, A-08775 L12 Only a part of this image is visible in the photo of Brown in his studio but it is not consistent with other known images. Goldstream Falls June 1883 Collection of Melvin Holmes, San Fran Colonist June 29 1883 p 3 Colonist July 5, 1883 p 3 Lizette Collins, "Selling Promise of West" 36 BCA H03545 L14 One of his "Goldstream Falls" Painting described in newspaper as just completed. "The sketch was taken in the afternoon when the cool, refreshing pool below the falls is in shadow, above the falls the sun lights up the foliage in rich warm tints, giving the entire picture a clever picturesqueness." "the glorus tints of summer foliage under a bright blue sky is delicately handled - the waterfall itself looking as natural as it looks to the eye of those who say it falling into the midst of the cedar and pine of the forest." L13 has now been identified as the same as L14. 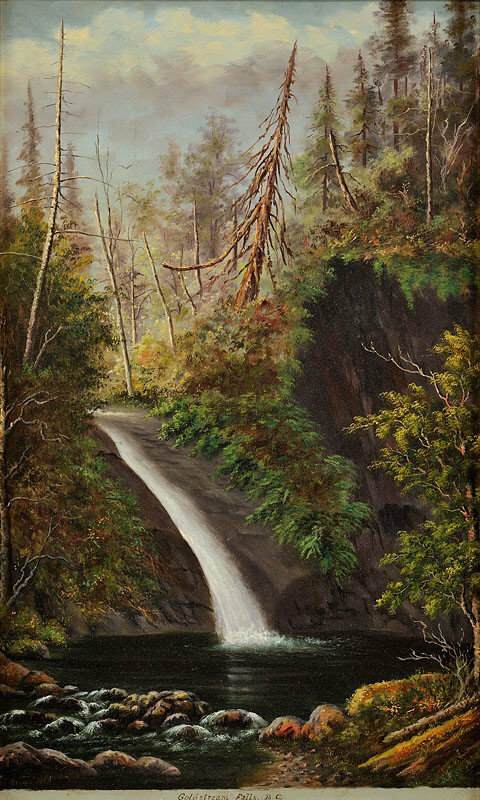 Goldstream Falls 1885? 26x17.5 Hampton University Museum Lizette Collins, "Selling Promise of West" 39; Chandler, 217. L15 May be the same as L18. Spallumcheen Country ? Unknown BCA HP23773 F1975 L16 Slab of granite fits Cat Item # 12 but the trees do not agree with description. BCA Cat says "Spillimachine country. 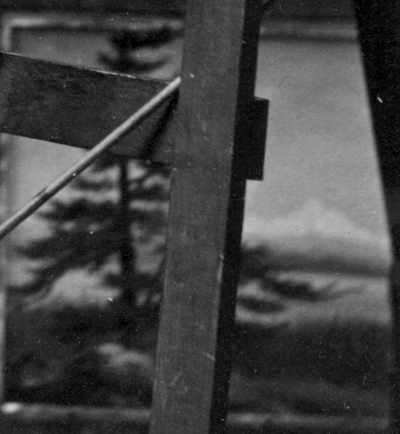 [Detail of Tree 2] 1883 Unknown Unknown Brown photo, BC Archives, A-08775 L17 Only a part of this image is visible in the photo of Brown in his studio but it is not consistent with other known images. [L18 Goldstream Falls?] 1883 Colonist June 29 1883 p 3 Colonist July 5, 1883 p 3 Unknown Brown photo, BC Archives, A-08775 L18 Only a part of this image is visible and blurry in the photo of Brown in his studio but it is not consistent with other known images of Goldstream though may be the same as L15. [Okanagan?] 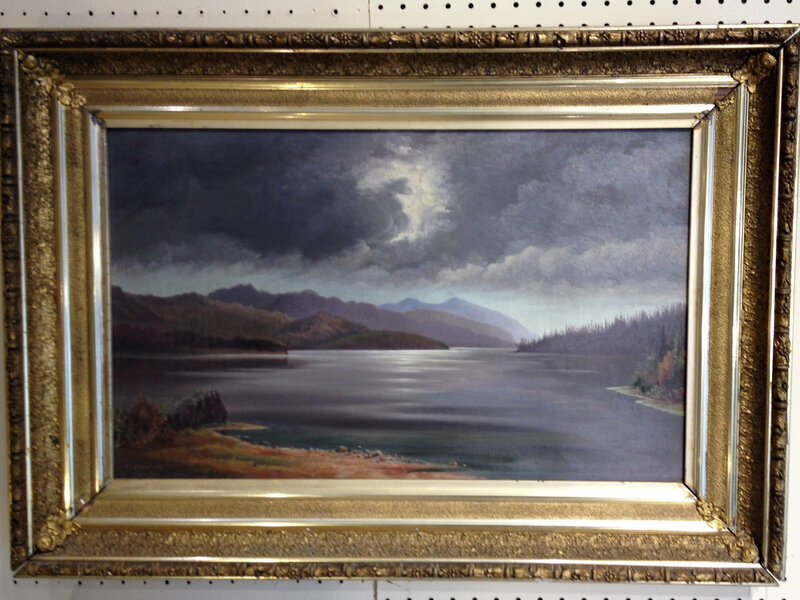 15 3/4"x 26" Sold at auction in Victoria October 21st 2018. L19 May be the same as 3 ‘After the Storm, Shuswap Lake, B.C.